Whatever way of travelling you prefer, the somewhat distant kingdom of the northern lights is easily accessible. If you are flying to Northern Norway from abroad you will most likely have to transfer in Oslo. There are approximately 250 flights a week from Oslo to Northern Norway. Please note that there are several airports in the Oslo area. Almost all flights to Northern Norway depart from Oslo Airport Gardermoen (OSL) but many low-cost airlines operate out of Torp Sandefjord Airport (TRF). SAS has a wide range of routes that will take you to Northern Norway. 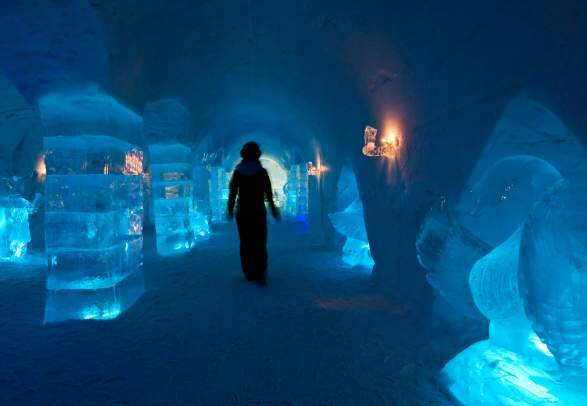 With their extensive network you can wake up in London and go to bed in the snow hotel in Kirkenes. The possibilities are numerous with SAS, which flies to Bodø, Evenes, Tromsø, and Alta. Fly directly to Tromsø with Norwegian, or fly to Oslo where it is easy to connect with one of the many domestic flights to Arctic Norway. Norwegian offers direct flights from Oslo to Bodø, Harstad/Narvik, Bardufoss, Tromsø, Alta, Kirkenes and Longyearbyen. The Norwegian airline Widerøe offers scheduled flights to 42 airports all over Norway, with as many as 24 located in Northern Norway. Fly to Bodø or Tromsø and continue to exotic winter destinations in Lofoten, Vesterålen, or Finnmark. The Norwegian Coastal Voyage Hurtigruten calls at 34 ports in Northern Norway, with stops varying from 5 minutes to 4 hours depending on the size of the port. You are free to go ashore if you wish. Several express and local boats will take you around Northern Norway. The express boats are fast and comfortable and enable you to move efficiently between the regions of Northern Norway. However, local boats take you to Northern Norway’s smaller, hidden areas. Getting to Northern Norway is not as difficult as one might think. Travelling by plane is the quickest way of getting there, but the scenic coastal route with Hurtigruten or a picturesque train ride through wild nature is surely a memorable experience in itself. Whatever way of traveling you prefer, the somewhat distant kingdom of the northern lights is easily accessible. Norwegian offers more nonstop flights from the US to Norway than any other airline. With a new fleet, friendly service and low prices, your journey is no more than 7 hours from the US East Coast. It has simply never been more convenient to experience Norway’s breathtaking fjords, majestic mountains and vibrant cities! Combine a 5-day voyage in search of the mystical northern lights. We sail through beautiful Vesterålen and the Lofoten Islands, stopping in scenic towns such as Bergen, Tromsø, Ålesund and Trondheim. The Norwegian State Railways (NSB) operates most passenger train services in Norway and has a railway network stretching from Kristiansand in the south to Bodø above the Arctic Circle. The Nordlandsbanen railway line takes you deep inside the polar regions, where the northern lights dance across the sky in the winter nights. The E6, the main north-south road through Norway, holds a good standard and can generally be driven all year round. From Majavatn at the border of Trøndelag county it runs 1,670 kilometres to Kirkenes via Fauske, Narvik, Bardufoss, Alta, Lakselv, and Tana bridge. There is one ferry crossing on this route. A more scenic alternative is The National Tourist Routes. They are an attraction in themselves, but take longer to drive because of their many ferry crossings. Occasionally, the E6 mountain passes are closed due to bad weather. They normally open after few hours. Make sure to check the weather forecast before you start driving. Let us help you make your journey as smooth as possible. Filter your search and check out the offers below.